These pages got all the stock image hand models clickin’. Image source. 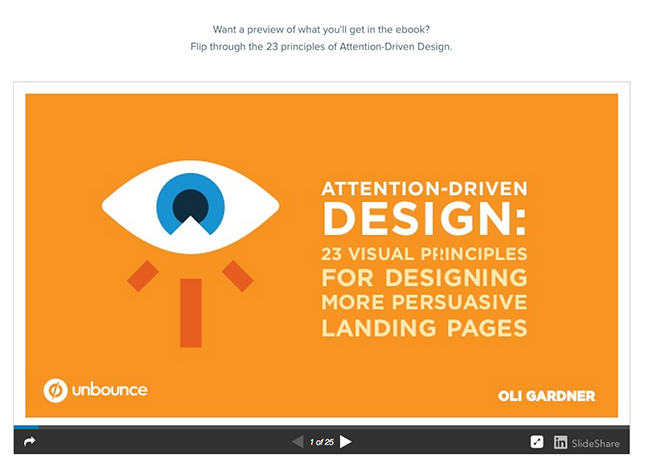 Last month we held a contest on the blog, challenging marketers to create a click-through landing page to promote our latest ebook, Attention-Driven Design: 23 Visual Principles for Designing More Persuasive Landing Pages. 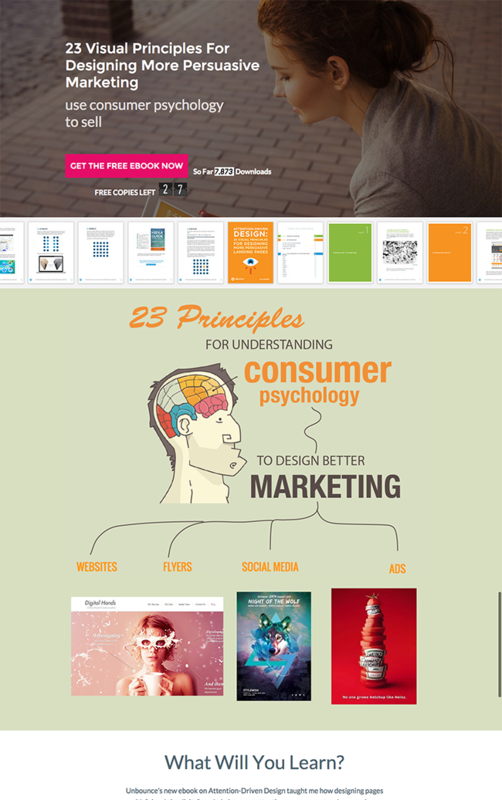 It was an experiment to determine which design principles and “best practices” make for a seductive click-through landing page. But instead of getting a panel of judges to wax poetic about which landing pages they thought were great, we thought we’d publish the pages and let visitors decide: which ones would actually get people to click through and then convert? Before we talk about the winning pages and what made them so darn titillating, a quick review session. Let’s take a look at how click-through landing pages differ from their lead gen landing page cousins — both in form and function. 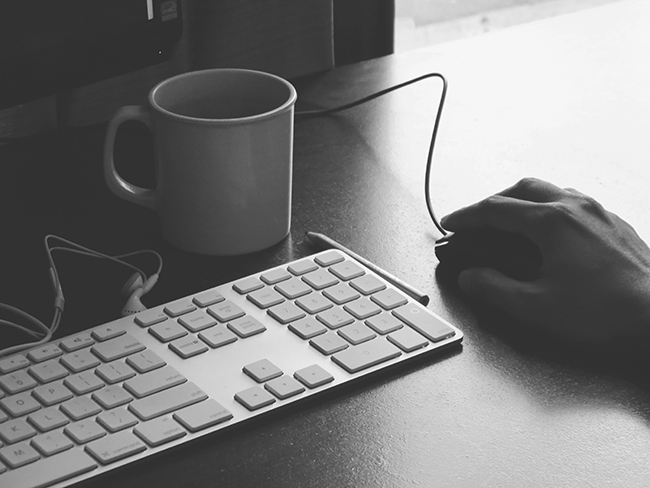 WTF is a click-through landing page? 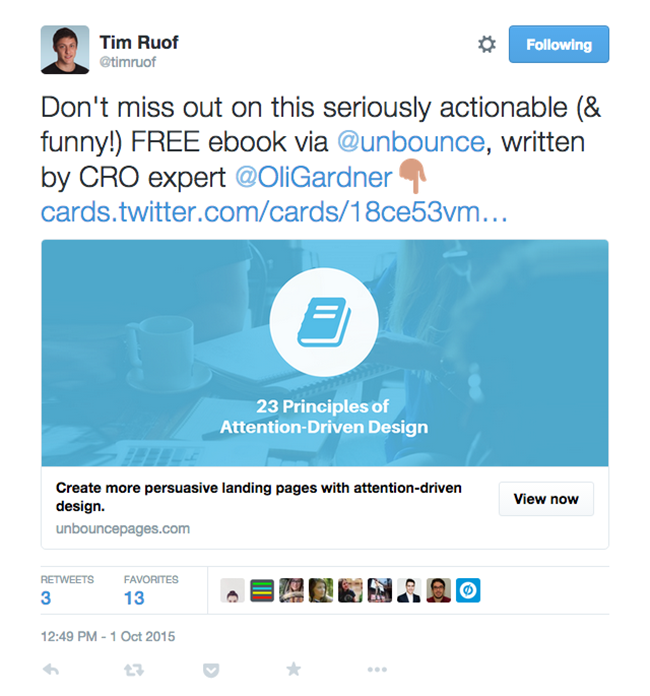 Click-through landing pages do exactly what it says on the tin. Unlike lead gen landing pages, they don’t have a form on the page asking people to opt in. Instead, they have a goal of convincing visitors to click through to another page (where the actual conversion happens). They’re frequently used in ecommerce funnels to describe a product in detail and “warm up” visitors for their purchasing decision. They combat the cognitive dissonance that is created when someone clicks on an ad for a specific product and they wind up on a seemingly irrelevant generic product page. Click-through pages are a great way to create an interstitial experience that confirms the intent of your ad in a simple way, maintaining the attention of your visitor, and then guides them through the purchasing decision before taking them further down the funnel. Simple enough, yeah? But if you’re gonna use a click-through landing page to “warm up” visitors and reassure them that they’ve made a “good click,” you also wanna be sure you’ve optimized the heck out of it. 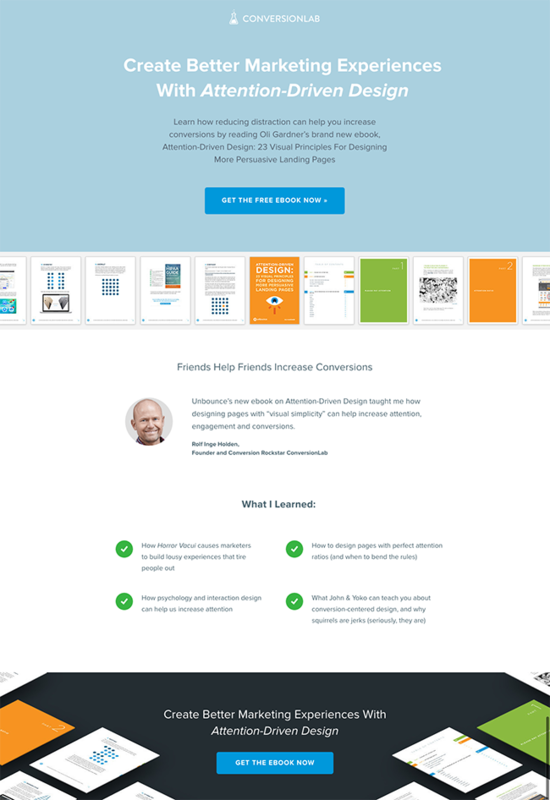 Without further ado, let’s look at our winning click-through landing pages — the ones that lead to the most ebook downloads — and see which Attention-Driven Design principles they employed to get people to convert. Click to view full landing page. 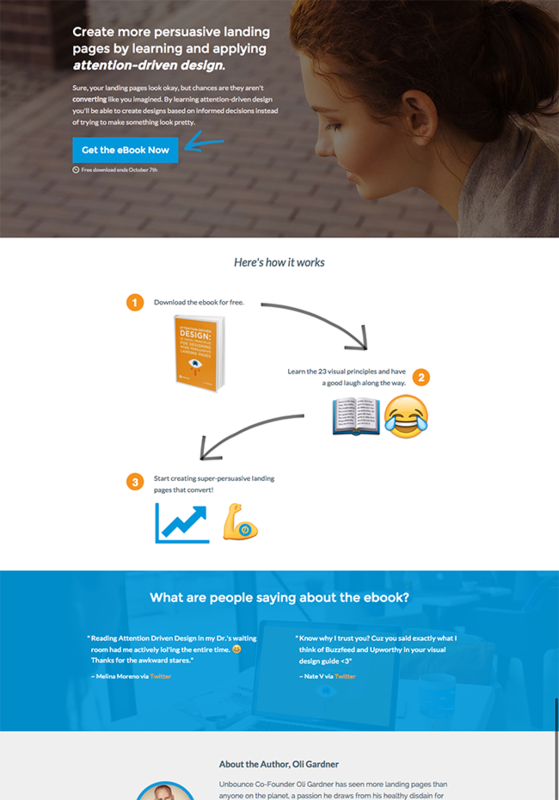 A little lower on the page, for prospects who need a little more information to be persuaded, they include a SlideShare preview of the core concepts from the book. The information hierarchy is strong with a nice linear top-to-bottom reading experience and nicely balanced font sizes for easy reading. Overall, a very clean design – which I’ve come to expect from Conversion Lab. Indeed. Congrats on placing 4th, Conversion Lab! What really stands out about Tim’s page is his generous use of directional cues to guide your eye down the page. One minor quibble: Oli pointed out that the model is looking downwards — under the CTA — so there’s no benefit to the angle of her gaze. I like how the continuation arrows are used to guide you through the reading experience. It may not seem like a big deal, but this really helps both the visual and information hierarchy. I’d remove the links to the tweets though and perhaps cut and paste the actual tweet so it looks exactly like Twitter. Talk about going the extra mile. Awesome job, Tim. This designer chose to keep the model hero shot. It’s interesting as to what impact it would have. As it’s an ebook download page, it could be posited that the model may confuse matters and she does look kinda sad. Oli also congratulated Winsome Writing for including a bold CTA button which contrasts nicely with the rest of the page. Overall, a solid effort that secured Winsome Writing second place in the contest. Pat yourselves on the back! 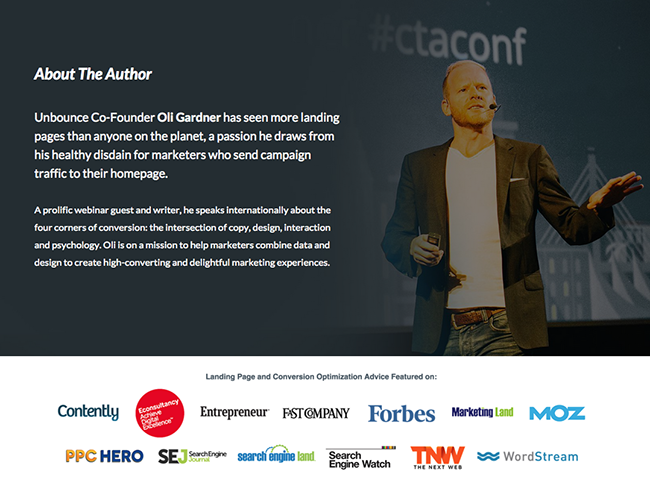 …This landing page scored creator Sherif Makhlouf an all-expenses-paid trip to Vancouver for Call to Action Conference 2016! As Oli pointed out, it’s pretty clear that Sherif read the book — he employed several Attention-Driven Design principles. There’s Direction: the way the model’s gaze directs your attention to the CTA, and the Contrast of the big pink button. Finally, the third page section uses Continuation effectively, helping to draw your eye down the page. The use of “only 27 free copies left” is a nice touch, not mentioning price but insinuating that it will become a paid ebook soon. It’s worth mentioning that this is in fact false scarcity — the ebook will remain free forever, we swear! But that this page is the winning page speaks volumes about the psychological power of these tactics. 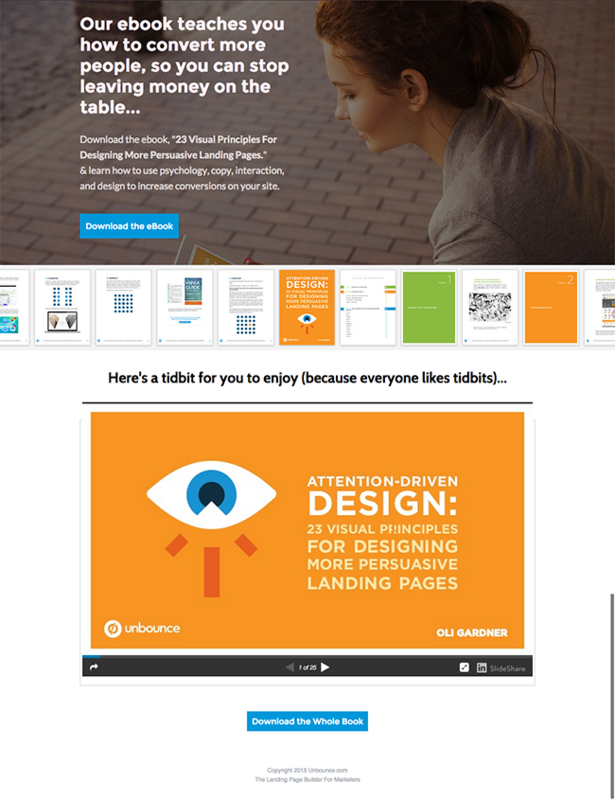 Thanks to everyone who submitted landing pages to our Attention-Driven Design contest — you guys never cease to amaze us. And special congrats to Sherif, you sneaky-but-super-smart marketer! We can’t wait to meet you at Call to Action Conference 2016. By entering your email you expressly consent to receive other resources to help you improve your conversion rates. You can unsubscribe at any time.